The Dexter S112-10PCP 04103 Sani-Safe® butcher knife has a 10-inch DEXSTEEL™ blade made of high-carbon steel that can take a very-fine edge, so it can easily cut through various meats. Since the blade is resistant to staining, the knife maintains a clean look. The 5-inch handle is constructed of polypropylene to withstand high and low temperatures. A safe, secure grip is provided by the textured handle. 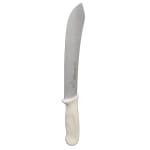 The Dexter S112-10PCP 04103 Sani-Safe butcher knife features a seal between the blade and handle, which eliminates a crevice that can capture food particles and harbor bacterial growth. "I work at a Barbque place in Texas and this is definitely one of the sharpest knives I have used. Cuts sausage, Brisket, ribs, chicken, and other..."
"I work at a Barbque place in Texas and this is definitely one of the sharpest knives I have used. Cuts sausage, Brisket, ribs, chicken, and other meats very well. This knife is a great knife to use!"